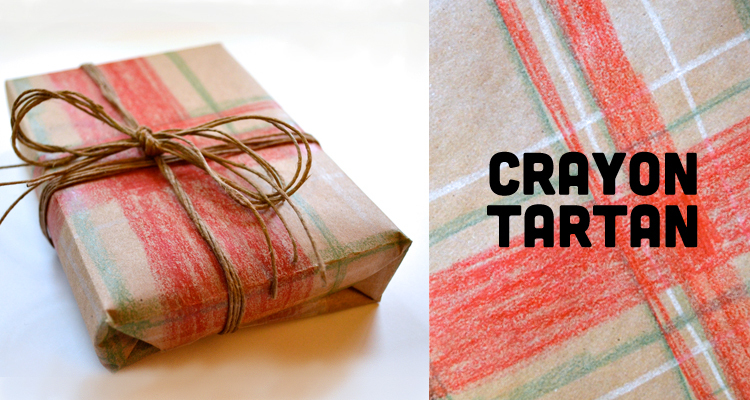 My favorite way to step up my wrapping game starts with the most basic supply: brown craft paper. While holiday wrapping paper can be spendy, a big roll of craft paper is usually pretty cheap and includes a heck of a lot more square footage than the fancy printed stuff. Plus, it’s thick! If you’re ever worried about the packaging showing through, this paper will have you covered. 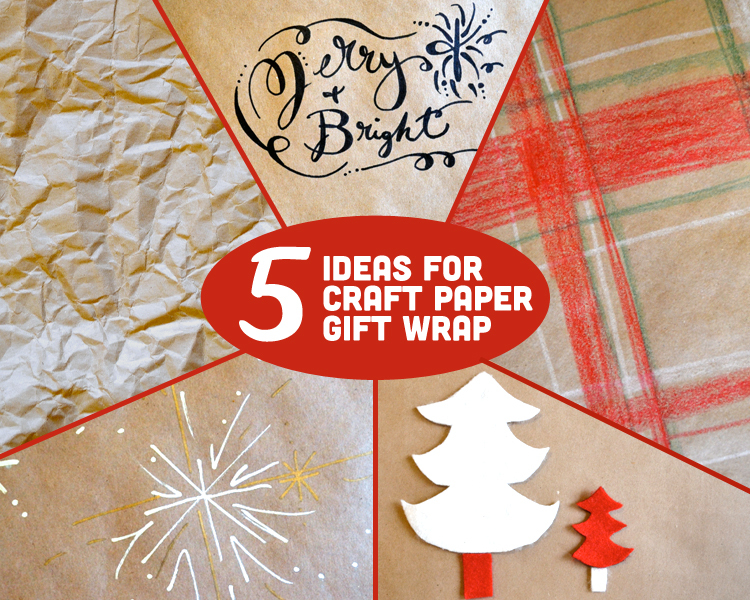 While the brown paper on its own is perfectly beautiful with a nice ribbon, I’m offering up five ways to customize your craft paper wrapping this year. Try them out and let me know if you have any other ideas! Kids will love helping. Also great for adults who need to work out some holiday stress. Any kind of crayon kid drawing on this paper works wonderfully, but if you are acting as artiste, I suggest a simple tartan pattern. Pull the red, green and white crayons out from the box. Measure and cut your craft paper to fit the package. Working on a hard surface, roughly draw out thick and thin lines in each color, perpendicular to each other. Don’t worry about being too perfect; what makes this looks so nice is how the colors overlap each other. Play around with the pressure you use on each line. Looks fabulous with about five minutes of work. And if you’re like me, drawing with crayons is a feel-good activity, so, you know…bonus! I’m pretty much obsessed with fake calligraphy. I first learned about it through Lindsay’s (great name) tutorial over at Jones Design Company. Now I do it all the time, including on all 37 of our holiday card envelopes this year. So why not on a package? Just pick out a phrase from your favorite holiday song, cut a piece of paper for your package, and figure out how you want the words to fit on the package. If you’re feeling unsure, go ahead and draft the words in light pencil lines on the package, erase, and try again until it looks good enough. 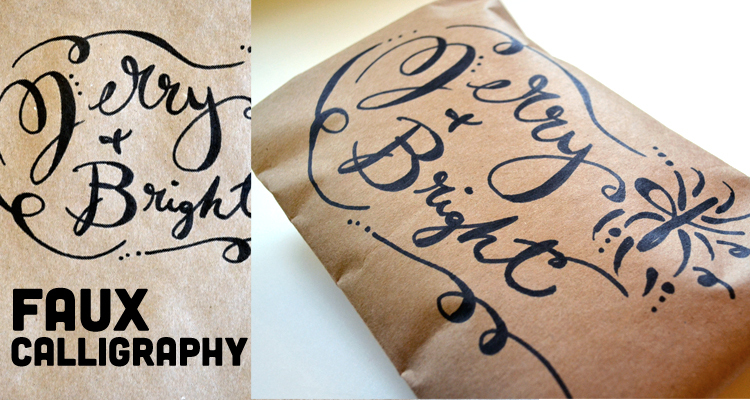 Then use a thick marker (I used a thin-tip Sharpie) to create the fake calligraphy effect. This one may be the easiest of the bunch. Well, crunching paper into a ball is pretty easy…so maybe this is the second-easiest. Grab a couple of metallic markers, such as paint pens or Sharpies (swear I’m not advertising for them.) 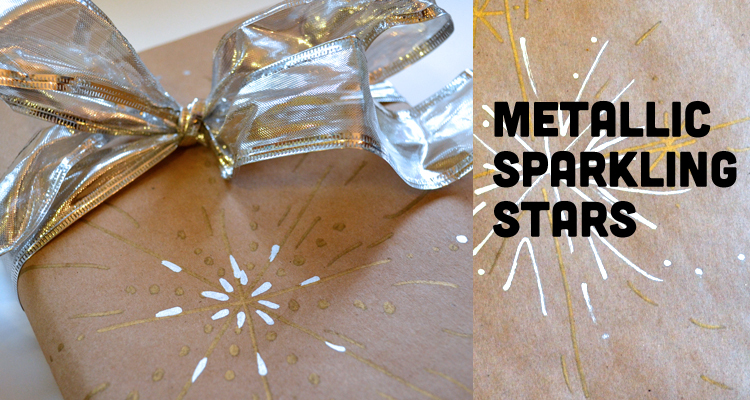 Lay out your pre-cut paper and start sprinkling on the stars. Get as ornate or as simple as you want. The metallic really pops off the brown paper…trust me, it looks even better in person. What’s a holiday without some good sparkle and shine? 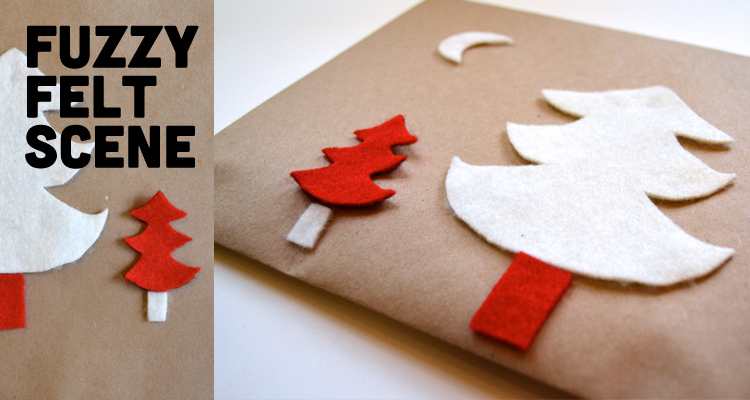 I’ve had leftover felt scraps in my craft bin for years, and this is a great way to finally use them. 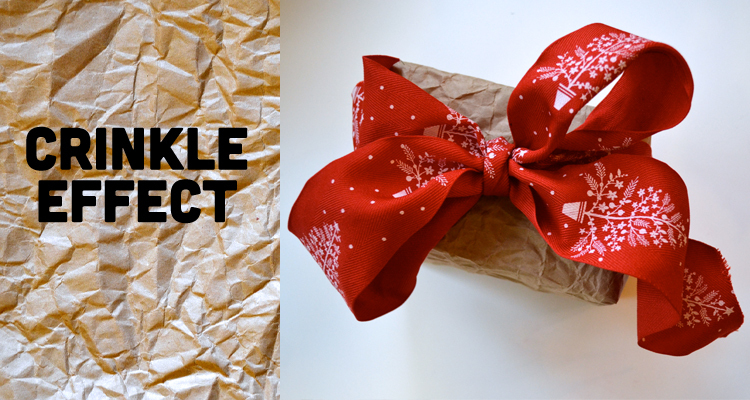 Wrap your package with the brown craft paper. Figure out what kind of design you would like to create. I went with an easy tree scene, but stars, wreaths, ornaments, and bows would all be awesome. Once you have the scene arranged as you like, use scrap booking adhesive dots to fix the felt to the paper. One final tip: Because the craft paper is so thick, you may need to be liberal with your tape in order to get the corners to stay put. Paper tape works especially well and may not require as much to stay fixed. Plus, a cute color or design would make the package look especially darling. I love it! I did all of my wrapping in craft paper this year. It looks wonderful under the burlap wrapped tree! I loved the writing on the Christmas card! I showed Matt and he was impressed too. These wrapping ideas are lovely!